The Friends of the Cowell Lime Works Historic District will unveil a National Register of Historic Places plaque recognizing the campus's historic lime-producing district during a ceremony from 4-5 p.m. October 30 at the Cook House, located just inside the UC Santa Cruz main entrance at the corner Bay and High streets. 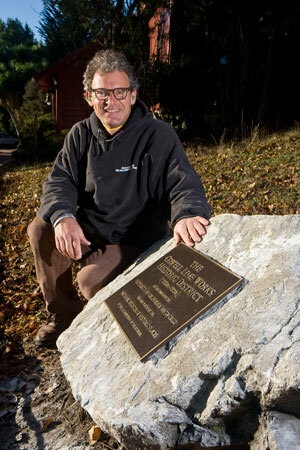 The permanent bronze plaque will be installed on a base of Cowell Ranch limestone. Securing designation of the district as a National Historic Place is the culmination of many years of effort by area historians and the campus to recognize its historical significance to the region, the state, and the nation. The historic district is an area of about 30 acres around the main entrance of the campus on either side of Coolidge Drive. The district includes historic buildings and lime production features and related support facilities that date to the latter half of the 19th and early 20th centuries. The UCSC campus was established on lands that once were part of the Cowell Ranch. Henry Cowell, a major industrialist in central California, operated a large complex of industrial lime production and support facilities scattered throughout what are now campus lands. His local holdings also extended widely into surrounding areas. Lime, which was produced at the campus site by burning limestone in large redwood-fired kilns, was critical in the manufacture of mortar, plaster, and whitewash, and also was used in a number of other industries. The complex of historic buildings and features that have been included in the campus's historic district are of particular historic value because they represent the full range of facilities needed in a historic rural industrial operation, including both lime-processing facilities and also ranch and worker-support buildings. Dubbed the Cowell Lime Works Historic District, in December 2007 the site was added to the National Register of Historic Places, the nation's official list of significant cultural resources worthy of preservation. The historic district includes the Granary, now a childcare center; the Cook House, now the Admissions office; several barns; the Cooperage, where barrels for lime shipping were made; the ruins of former workers' cabins; the Blacksmith Shop; Cardiff House, now the Women's Center but formerly the residence of lime works owner Henry Cowell; and the lime kilns themselves. The district is important in the history of economic and physical development of the Monterey Bay region and, as the largest center of lime making in Northern California at peak production in the late 19th and early 20th centuries, it is significant in the history and development of the state from the Gold Rush through the early years of the 20th century.